M-PAC was created as a division of the Alliance to enhance the community by providing art in publicly accessible spaces by being a resource for the City of Marshalltown. M-PAC's main focus is on the city of Marshalltown and has contributed to the city with the addition of Echo in the 13th Street District and getting Marshalltown labeled as a Great Places in Iowa. M-PAC's is led by an all volunteer committee composed of community members who believe art can enhance and create a sense of belonging. "M-PAC really helped us to open our minds to the possibilities and to think in terms of the big picture. M-PAC helped us realize that what we really wanted for the District was an iconic presence that offered the "otherness" factor. Getting past our initial narrow vision to achieve the end result would not have been possible for us without the help and guidance of M-PAC. Their help in guiding us through the process of identifying our objectives, defining our project, soliciting RFP's, selecting the artist, working through contractual issues with the selected artist, installation of the art piece, etc., was essential to the success of our project." The City of Marshalltown is one of the recommended organizations for a grant of $25,000 to support a Master Planning Project for the Iowa River Trail related to the inclusion of public art, wayfinding and place making. The City in partnership with the Marshall County Arts & Culture Alliance, Marshalltown Public Art Committee, TRAILS, Inc. and the Hardin County Trail Commission are looking forward to the opportunity to plan for the future of the Iowa River Trail. The project will include working with a consultant to develop a comprehensive design plan to extend throughout the 34-mile stretch from Marshalltown north to Steamboat Rock. The plan will look at way finding, public art opportunities and trail head identification. With the funding from the NEA a focus on place making and public engagement in the process is a priority. The Martha-Ellen Tye Foundation has awarded an additional $50,000 to support the Iowa River Trail Master Plan project. This additional funding will support more detailed conceptual plans at identified locations along the trail. The City of Marshalltown is 1 of 60 National Endowment for the Arts Our Town Projects Selected Nationwide. For more info about the grant, read this article published in the Times Republican or visit the City's website! The idea for public art on 13th Street came at a time when M-PAC had just formed and when the 13th Street District Committee was looking for ideas to incorporate art in the newly revitalized district. A new venture for both groups, M-PAC reached out to public art consultant, professor, and artist – Tom Stancliffe. A Request for Qualifications was sent to 15 artists nationally – and all 15 responded with interest! With the help of both M-PAC and the 13th Street District Committee, three artists were selected as finalists. Input from the public was sought as a selection jury was formed for the final selection. In January of 2014, Bruce White’s concept for Echo was chosen. Echo, the work of Illinois artist Bruce White, is a 34’ tall stainless steel sculpture sitting at the center of the 13th Street District. Since installed in 2015, Echo and its surrounding green space creates a grand welcome into the District providing a unique space for community gatherings. Completed in May of 2015, Echo was gifted to the City of Marshalltown. ​"If I could say it, write it or sing it, there would be no need to build it." M-PAC would like to thank the City of Marshalltown for their assistance on this project and to our funding partners: Iowa Great Places, Martha-Ellen Tye Foundation, 13th Street District Committee, Community Foundation of Marshall County, Marshalltown Development Foundation, and Marshalltown Convention & Visitors Bureau. Learn more about Echo here! 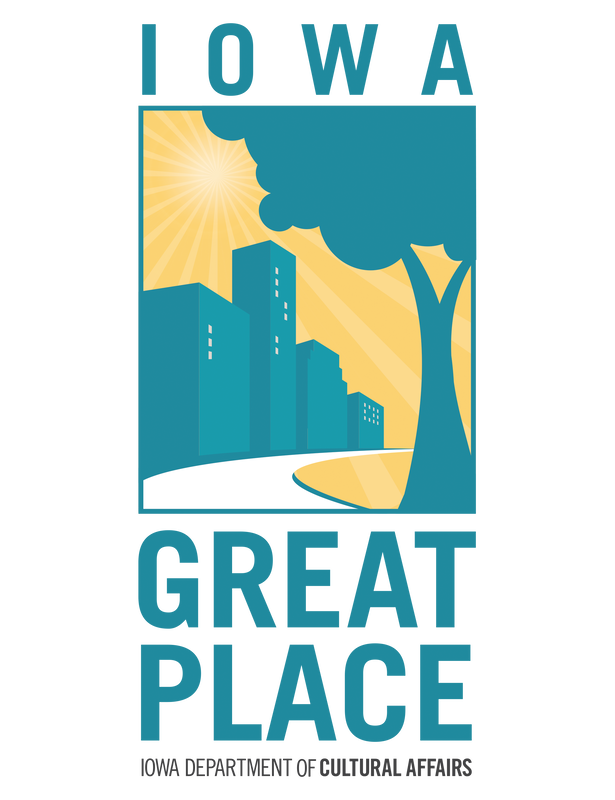 In 2014, Marshalltown was selected as an Iowa Great Places community by the State of Iowa Department of Cultural Affairs. The Marshall County Arts & Culture Alliance administered the grant which includes $250,000 specifically awarded to complete a public art project and exterior enhancements at the MHS Roundhouse. The 15 member selection committee included MHS students, Marshalltown Community School District staff, M-PAC members and the IGP grantee team. The committee received over 61 artists applications, including an artists from Australia. In Spring of 2016, Gail Folwell was selected to complete the MHS Roundhouse project which was to include the sculpture Drills, lighting, banners, benches, and a display of the original Roundhouse window plexiglass pieces in the MHS Roundhouse foyer. Drills, the work of Colorado artist Gail Folwell, is a 18' aluminum sculpture of three basketball players (2 male/1 female) sitting at the entrance of the renovated Marshalltown High School Roundhouse. Since installed in 2016, Drills welcomes you to the iconic Roundhouse representing community spirit and pride while exemplifying excellence and innovation. ​Gail Folwell of Boulder, CO who is internationally known for her large-scale public sculptures depicting athletes. “The beauty of public art is the capacity to connect a personal experience to place. As an athlete and artist I have long been fascinated by body language and what a gesture can convey. I make art to visit an experience. For the same reasons we play games, attend events and watch sports - I want to feel the effects of something inspiring. I am Gail Folwell, a sculptor of public art.” Drills captures the excitement of student life while paying homage to the building’s history and architecture. Drills was installed on November 28th, 2016. This project was funded by the Marshalltown Public Art Committee, a division of Marshall County Arts & Culture Alliance through the Iowa Department of Cultural Affairs grant for Iowa Great Places. ​Check out a video clip of the installation of Drills. ​Marshalltown was designated as an Iowa Great Place in 2014 through a grant submitted by the Arts & Culture Alliance in partnership with the City of Marshalltown. ​The Iowa Great Places program seeks to recognize communities taking action to enhance their local places while staying true to the qualities that make them unique. Designated communities have demonstrated a vision that values their assets while challenging themselves to set realistic goals for advancing their quality of life. The program goals are to cultivate the unique and authentic qualities of Iowa neighborhoods, districts, communities and regions in order to make them great places to live and work through professional development training, technical assistance opportunities, a network of vibrant communities and passionate leaders, and access to other state and local resources. The Iowa Great Places grant supported two of M-PAC's early projects, Echo in the 13th Street District and Drills at the Marshalltown High School Roundhouse.